Which particles have approximately the same mass? 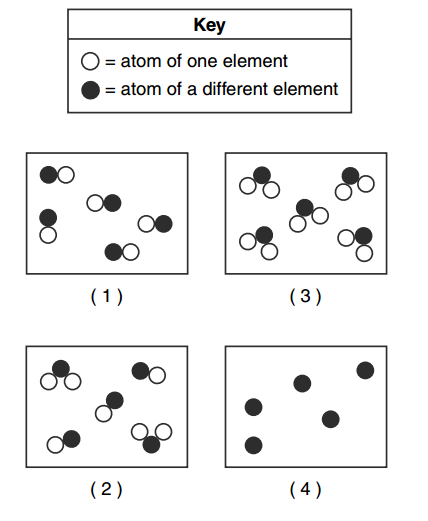 Which quantity can vary among atoms of the same element? Which substance have atoms of the same element but different molecular structures? Which elements have the most similar chemical properties? Which list includes three types of chemical formulas for organic compounds? Which statement defines the temperature of a sample of matter? Temperature is a measure of the total electromagnetic energy of the particles. Temperature is a measure of the total thermal energy of the particles. Temperature is a measure of the average potential energy of the particles. Temperature is a measure of the average kinetic energy of the particles. Which statement describes the particles of an ideal gas, based on the kinetic molecular theory? The motion of the gas particles is orderly and circular. The gas particles have no attractive forces between them. The gas particles are larger than the distances separating them. As the gas particles collide, the total energy of the system decreases. Which compound has the strongest hydrogen bonding between its molecules? Which term is defined as a measure of the disorder of a system? Which process is used to determine the concentration of an acid? Which term identifies the half-reaction that occurs at the anode of an operating electrochemical cell? In which type of chemical reaction are electrons transferred? Which compound is an electrolyte? Which term identifies a type of nuclear reaction? Which radioisotopes have the same decay mode and have half-lives greater than 1 hour? 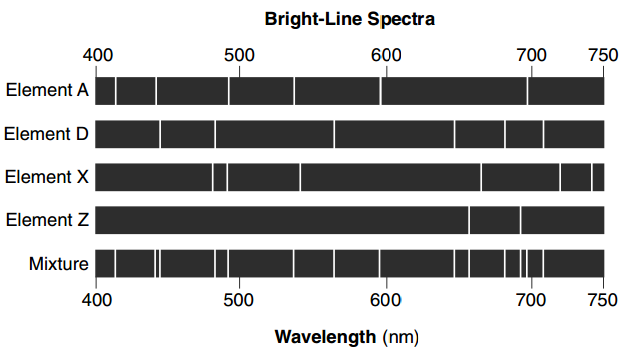 The diagram below represents the bright-line spectra of four elements and a bright-line spectrum produced by a mixture of three of these elements. Which element is not present in the mixture? What is the overall charge of an ion that has 12 protons, 10 electrons, and 14 neutrons? Which electron configuration represents the electrons of sulfur atom in an excited state? Which type of chemical reaction is represented by this equation? Which compound has the highest percent composition by mass of strontium? How many pairs of electrons are shared between the two nitrogen atoms? Which formulas represent one ionic compound and one molecular compound? Which Kelvin temperature is equal to 200. ºC? A 10.0-gram sample of H2O(l) at 23.0ºC absorbs 209 joules of heat. What is the final temperature of the H2O(l) sample? Which particle diagram represents a sample of matter that can not be broken down by chemical means? Which formula represents an unsaturated hydrocarbon? A 10.0-milliliter sample of NaOH(aq) is neutralized by 40.0 milliliters of 0.50 M HCl. What is the molarity of the NaOH(aq)? Radiation is spontaneously emitted from hydrogen-3 nuclei, but radiation is not spontaneously emmited from hydrogen-1 nuclei or hydrogen-2 nuclei. Which hydrogen nuclei are stable? After decaying for 48 hours, 1/16 of the original mass of a radioisotope sample remains unchanged. 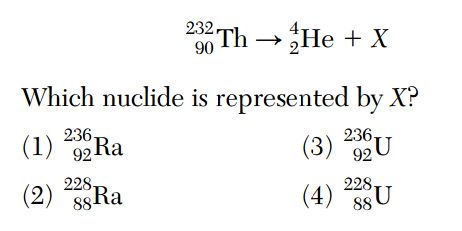 What is the half-life of this radioisotope? Which balanced equation represents nuclear fusion? Balance the equation below for the reaction between magnesium and nitrogen using the smallest whole-number coefficients. In the ground state which noble gas has atoms with the same electronic configuration as a magnesium ion? Explain in terms of electrons, why an atom of the metal in this reaction forms an ion that has a smaller radius than its atom. An atom of magnesium loses its outer shell electrons to form the Mg2+ ion. The electron configuration of a magnesium atom is 2-8-2, and the electron configuration of the magnesium ion is 2-8. The balanced equation below represents a reaction. Identify the chemical bond in a molecule of the reactant. Draw a Lewis electron-dot diagram of one oxygen atom. Explain why in terms of bonds, why energy is absorbed during this reaction. Starting as a solid at 25°C, a sample of H2O is heated at a constant rate until the sample is at -25°C. This heating occurs at standard pressure. 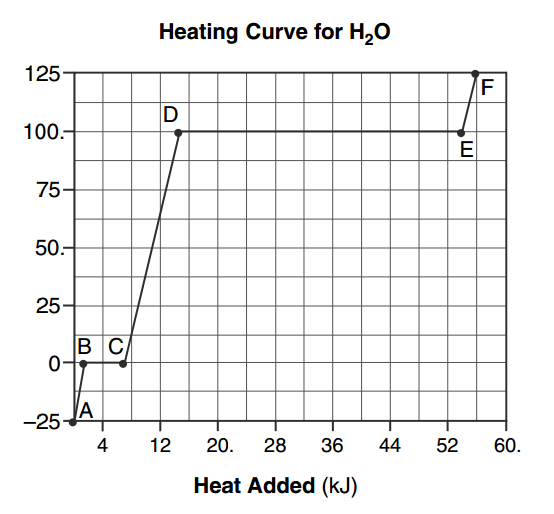 The graph below represents the relationship between temperature and heat added to the sample. Describe what happens to both the potential and the average kinetic energy of the molecules in the H2O sample during interval AB. The potential energy remains the same, but the average kinetic energy of the H2O molecules increases. There is no change in potential energy. There is an increase in the average kinetic energy. Starting as a solid at 25°C, a sample of H2O is heated at a constant rate until the sample is at 125°C. This heating occurs at standard pressure. The graph below represents the relationship between temperature and heat added to the sample. Using the graph determine the total amount of heat added to the sample during the interval CD. Explain, in terms of heat of fusion and heat of vaporization, why the heat added during interval DE is greater than the heat added during interval BC for this sample of water. The heat of vaporization of water is 2260 J/g and the heat of fusion for water is only 334 J/g. The heat of fusion of water is much less than its heat of vaporization. Cylinder A has a movable piston and contains hydrogen gas. 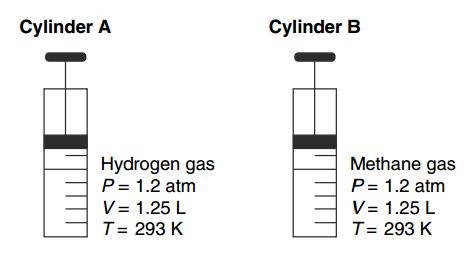 An identical cylinder, B, contains methane gas. The diagram below represents these cylinders and the conditions of pressure, volume, and temperature of the gas in each cylinder. Compare the total number of gas molecules in cylinder A to the total number of gas molecules in cylinder B. The number of gas molecules in cylinder A is the same as the number of gas molecules in cylinder B. State a change in temperature and a change in pressure that will cause the gas in cylinder A to behave more like an ideal gas. Show a numerical setup for calculating the volume of the gas in cylinder B at STP. There are several isomers of C6H14. 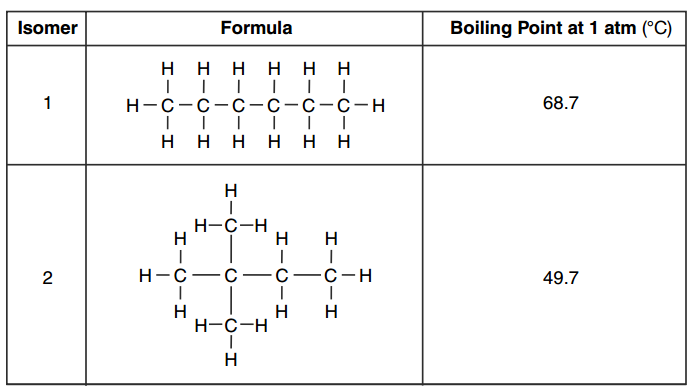 The formulas and boiling points for two of these isomers are given in the table below. 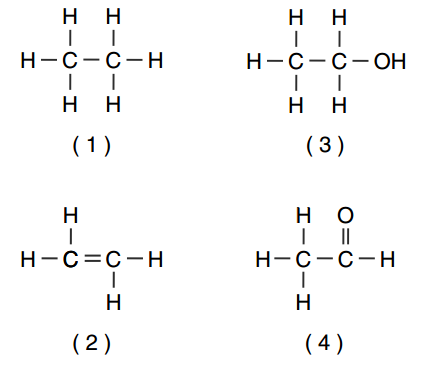 Identify the homologous series to which these isomers belong. Write the empirical formula for isomer 1. Explain in terms of intermolecular forces, why isomer 2 boils at a lower temperature than isomer 1. Isomer 2 boils at a lower temperature because it has weaker intermolecular forces than isomer 1.
parentheses after the symbol of each element. 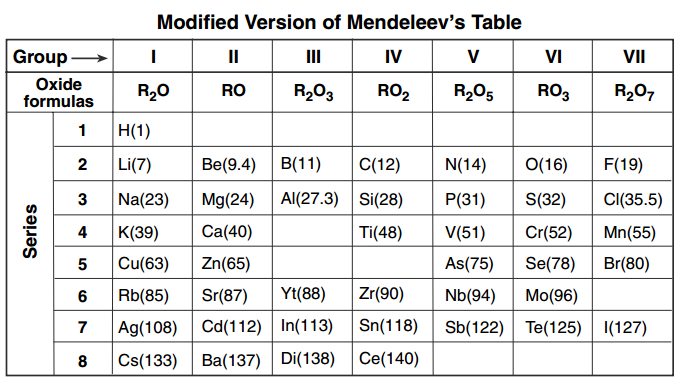 A modified version of Mendeleev’s classification system is shown in the table below. Identify one characteristic used by Mendeleev to develop his classification system of the elements. Based on Mendeleev’s oxide formula, what is the number of electrons lost by each atom of the elements in Group III? Explain, in terms of chemical reactivity, why the elements in Group 18 on the modern Periodic Table were not identified by Mendeleev at that time. Since the Group 18 elements tend not to react with other elements, there were no oxide compounds for Mendeleev to study. Group 18 elements are generally unreactive. balanced equation below represent this reaction. Determine the change in oxidation number for the hydrogen that reacts. 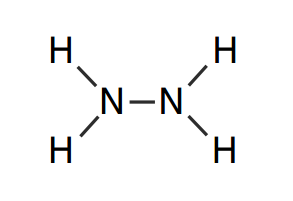 Write a balanced half-reaction equation for the reduction of the Pb2 ions in this reaction. 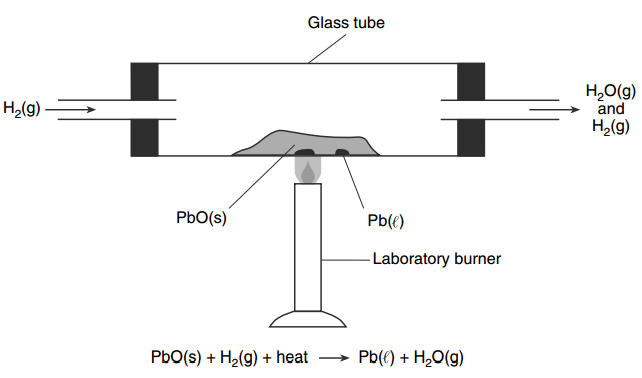 Explain why the reaction that occurs in the glass tube can not reach equilibrium? The glass tube is not a closed system. Gases are entering and leaving the system. The reaction is not reversible under these conditions. State one change in reaction conditions, other than adding a catalyst, that would cause the rate of this reaction to increase. Increase the concentration of the hydrogen gas in the tube. Grind the metal oxide to increase its surface area. In the late 19th century, the Hall-Herroult process was invented as an inexpensive way to produce aluminum. In this process, Al2O3(ℓ) extracted from bauxite is dissolved in Na3AlF6(ℓ) in a graphite-lined tank, as shown in the diagram below. The products are carbon dioxide and molten aluminum metal. Compare the chemical properties of a 300.-kilogram sample of Al2O3(ℓ) with the chemical properties of a 600.-kilogram sample of Al2O3(ℓ). Write the chemical name for the liquid compound dissolved in the Na3AlF6(ℓ). What is the melting point of the substance that collects at the bottom of the tank? Compare the densities of the Al(ℓ) with the density of the mixture of Al2O3(ℓ) and Na3AlF6(ℓ). The density of the aluminum is greater than the density of the Al2O3 and Na3AlF6 mixture. The density of Al(ℓ) is greater. For the student who needs more than just a classroom.